Today, android based smartphones are much more preferred over the Windows or iOS based phones. And one of the major aspects for this preference is the large number of amazing applications available in the Google Play Store which is the default marketplace for all the devices. However, today a very few people know that there are many other marketplaces other than the Play Store that offer you all the more amazing applications and games. 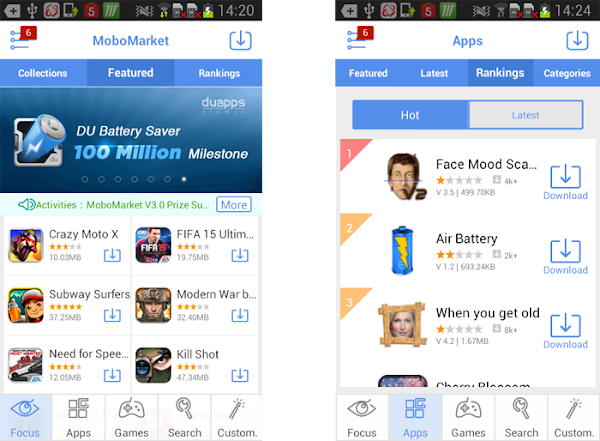 MoboMarket, a marketplace designed and developed by MoboRobo.com is one of the leading options to the Google Play Store. Crafted after analyzing several loopholes in the existing Play Store marketplace, MoboMarket boosts of several intelligent features that give the Android users a new smartphone experience. As MoboMarket hosts its own contents for users to download, instead of lead users to download from Google Play Store, MoboMarket is unavailable for download in the Play Store and requires a third party installation process. The entire setup for this marketplace is available on the default website of MoboRobo. One can easily download and install it in their smartphones without much complication. Once installed, MoboMarket does not require any sign-up or account sync procedures like the Google Play Store. Any user can directly start browsing through the marketplace and install applications they find interesting. This simple to use app thus ensures the user a free gateway without any marketing or advertising gimmicks. Unlike the Google Play Store, MoboMarket boosts of a geo-targeting feature that makes this marketplace all the more amazing. This feature helps the users in finding all the related applications based on their geographic location. Thus, this feature not just helps you in finding amazing events, offers and discounts nearby but also get your hands on some of the amazing applications that you might miss on in the Play Store. Along with the geo-targeting feature, the marketplace also provides you with a dynamic search function that helps you find all the regional application by using specific keywords. You can even scroll through the hundred thousand of applications listed under this marketplace by simply viewing the listed categories. MoboMarket today holds an enormous data of free applications that are unavailable in the Google Play Store. These applications can be downloaded and installed by any user having the MoboMarket on his/her device. The users do not require to sign-up or fill any form to use the marketplace unlike Play Store where it is mandatory to sign-in with your Google account. Thus, without any login procedures, a user is free to use the MoboMarket marketplace. Another appreciable aspect of this store is easy to use Graphical User Interface (GUI). The developers have ensured that the store remains simple with all things in its place. The store is thus categorized based on different segments and genre. You will find a large number of categories like games, applications, device personalization, etc. More to it, the store also provides you a section where you get all the trending applications within the marketplace. MoboRobo.com is celebrating its 2nd anniversary and has decided to take MoboMarket to an all new level by launching its brand new 3.0 version. With this new version, the users are expected to get a more precise and powerful operation interface along with improved geo-locations and content pushing systems. Amazing features, simple yet captivating GUI and a huge database of amazing applications, MoboMarket is one of the widely used Android stores other than the Google Play Store. Today it has over 100 million users across the globe, 40 million daily distributions and over 5 million daily active users. Wish MoboRobo and MoboMarket a very best luck for their future endeavors and hope these numbers keep on increasing by every passing day.